Today is my birthday and when I woke this morning, I started thinking about what image I’d like to put up here to commemorate the day. 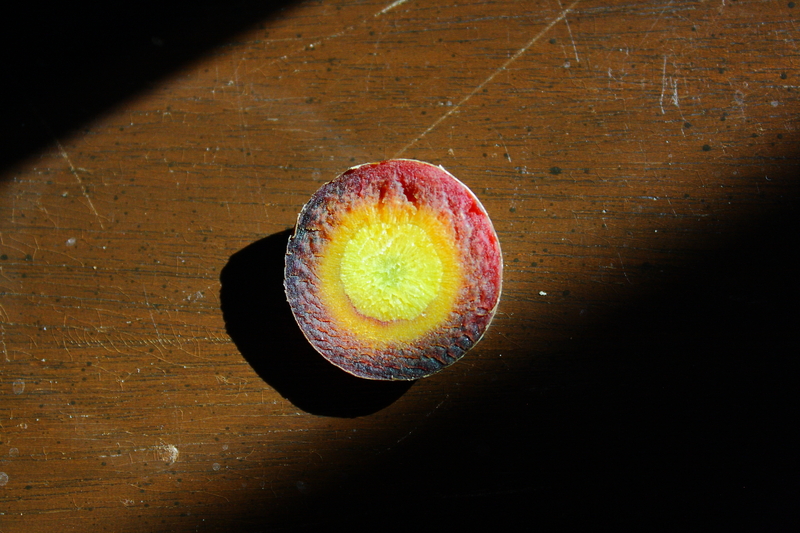 The answer came while I was preparing my smoothie: the end from a purple carrot. This little image feels like a worthy symbol of this day and the coming year. I, too, want to be vibrant and colorful, and shine like a sun bursting through a fiery ring. And bonus points if I also achieve antioxidant status! Happy birthday to me and my carrot. Hope you have a wonderful birthday as you prepare to embark on another year! I don’t know about antioxidant status, but I think you’ve achieved the other goals. Happy birthday! HA! Maybe antioxidancy should maybe be my goal for the year, Jenn! Thank you so much for the kind words and wishes. May you stay forever young. Happy birthday! And a Dylan quote for the win! Thank you much, Barb. It was a grand day and now I’m ready to see what comes next.